What is the difference between a coin, a token, and a medal? What are the most important tools a coin collector needs? What should a bride put in her left shoe for good luck? 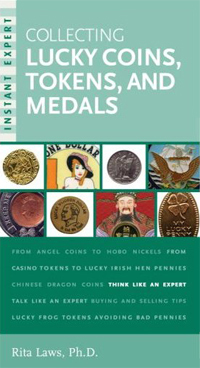 Collecting Lucky Coins, Tokens, and Medals also includes insider tips on buying and selling techniques, along with a guide to reliable sources and a glossary. This is a one-of-a-kind resource on what makes a particular piece lucky, along with excellent tips on detecting counterfeits and keeping your collection safe.